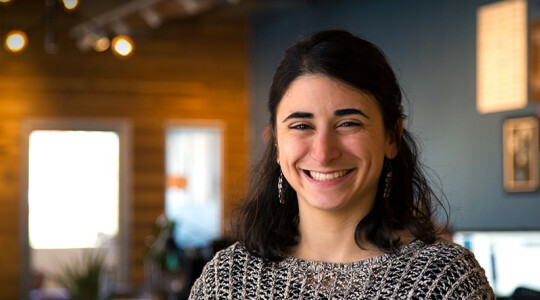 Talia comes to Jones-Dilworth, Inc. as an associate focused on design. A newcomer to Austin, she hails from New York City. She previously worked for Mogul.com, a platform to help women across the globe connect and exchange knowledge. Mogul exposed her to design thinking and the ins and outs of product development, along with the opportunity to design in different media from VR and animation to app design. Talia’s academic and work experiences align with her desire to understand people and human behavior. She studied film and anthropology at Mount Holyoke College and assessed independent films for potential acquisition and distribution at FilmBuff.com. Design is at the crossroads of visual creativity and the pursuit of human understanding; it begins with understanding the user, along with their challenges and desires. Talia loves the ephemeral nature of design, which turns intangible feelings and ideas into a tangible experience that communicates something and serves someone. Taking a client’s vision and goals and translating them into visual form is an extraordinary and rewarding challenge. I've watched all the Oscar winning Best Picture Films. (Since 1927). I've been told my spirit animal is a hummingbird. One of my major life goals is to meet Jim Dale! The amazing reader/performer of the audio book editions of Harry Potter.